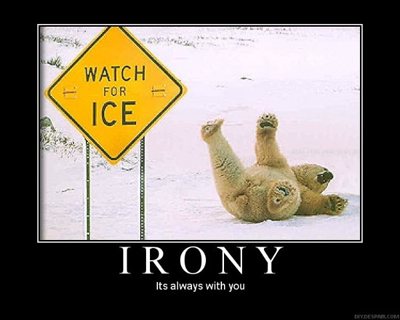 Here are a few illustrations of irony. Or stupidity. Or both. Y'all have heard this story that made headlines recently. "District to pay over $100K to ex-superintendent charged with pooping at H.S." Hmmm...pooping at H.S. Well, if he'd have used the bathroom at a high school, the event wouldn't have been newsworthy. However, Mr. Tramaglini was charged with pooping at a high school track. Outside. Over and over again. Like, daily. Not only is he being given a severance package of over $100K as the title of the article mentions, he's going to be able to draw unemployment without question. I guess it pays to poop in public. Next up is the couple from the United States who set out on a mission to bike around the world to prove that people are kind. That, "evil is a make-believe concept we've invented to deal with the complexities of fellow humans..." Huh. Their theory was sadly proven wrong in the worst of ways. Just as they entered Tajikistan, a country KNOWN for terrorist activity, they were rammed by a car driven by terrorists and then stabbed to death by those same terrorists. I guess not everyone is sweetness and light. And one more bit of irony for you coming straight out of the White House. You've no doubt heard of Omarosa and her 'tell-all' *cough* book. In it, there are mentions of tapes of President Trump using the "N-word" or are there? Just as Trump fired Comey a year ago, he tweeted out that Comey had better hope there were no 'tapes'. Irony? You decide. Stay tuned to The Political Chicken to find out what's going on in and around Harris County! You won't want to miss!